These cards are a very special way to show your Pastor(s) how much you appreciate them and a way to tell them "Thank You", but you certainly don't have wait until Pastor Appreciation Month to give your Pastor one of these beautiful cards. 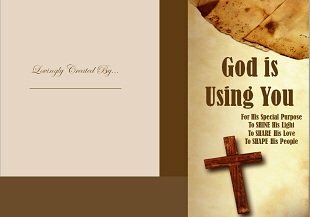 Feel free to download and print one or more of these cards anytime you want 24 hours a day 7 days a week and personalize them to give to your Pastor(s). The P.A.M. (Pastor Appreciation Month) Cards are a great idea for your church members to do during the entire month of October to honor your Pastor(s). Flood your Pastor(s) mailbox during the entire month by each individual member on a certain day sending their very own personal card with their personalized words added to the cards and signed personally by each member. These cards can show appreciation in a very special way to a number of recipients including Pastor and his wife, Youth Pastor and his wife and any other Pastor-related ministries. The second Sunday in October is always Pastor Appreciation Day officially but, of course, your church can pick any day they would like to celebrate it, and the entire month of October is celebrated as Pastor Appreciation Month. This PAM celebration was established in 1992 with a very important mission of showing appreciation by uplifting and encouraging Pastors, missionaries, and religious workers. I have by far the best Pastor in the world and I'm sure you may say the same about your Pastor. My Pastor has showed me how to have true Faith and a how to have a true relationship with my precious Lord and Savior Jesus, which is leading me into a perfect Love, Peace and Joy that is priceless to me. He works tirelessly trying to help every member in their time of need, answering nonstop phone calls, staying up late praying for them and much more but I cannot tell it all because there would not be enough time to do so. I said all of that to say this, My Pastor is worth much more than I could ever imagine to give him and I want to try and show him how much I appreciate him every chance I get, but especially in this very special month of October - Pastor Appreciation Month. Return to the Pastor Appreciation Ideas from Pastor Appreciation Cards.